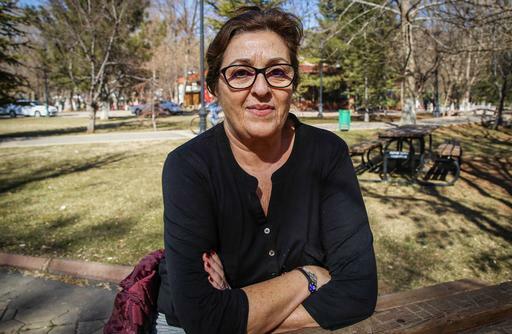 Nurse Sara Ferrer currently serves as coordinator of MSF's medical projects in areas of northern Syria's Aleppo Governorate. Here she discusses the importance of vaccination campaigns for children in the war-ravaged country. 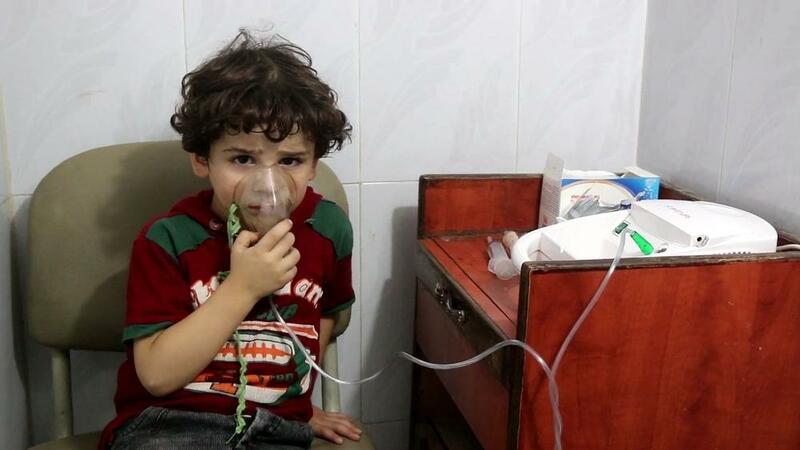 Why is it so important to focus efforts on vaccinating children in Syria? The war in Syria has been terrible due to the violence, but also because of the many serious side effects of conflict that go unnoticed. 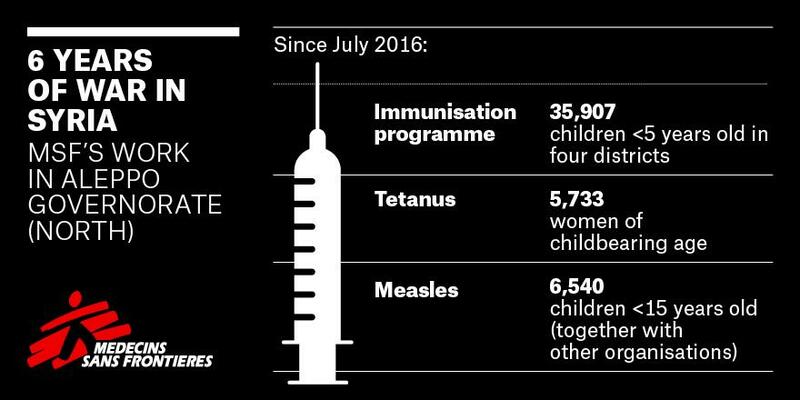 Since the conflict escalated in 2012, the vast majority of children born in many parts of Syria are unvaccinated and this is a major concern. Mass displacements of people mean medical authorities and NGOs have been unable to focus their efforts on these activities or have no resources for it. The most that some children have received is one or two doses in isolated campaigns. Syrian children are not prepared for a range of preventable diseases such as measles, rubella, tetanus or pneumonia. Before the war, children were normally vaccinated in Syria. However, we are now faced with a rather widespread problem, especially in the areas controlled by the opposition where we are working. The information we have obtained after monitoring the medical condition of displaced children from areas under Islamic State (IS) control is that they have not been vaccinated, although we do not know if it is a generalized issue. We do not have access to areas controlled by the Government of Syria, despite having requested permission. According to data from some medical authorities operating there, there are some vaccination activities. Have many cases of these infections have been documented? How worrisome is the situation? Cases have been documented and have been treated on time, though consolidated data is missing. The EWARN (Early Warning System, reporting to the health authorities) reports cases of infections throughout the country in the provinces of Raqqa, Idlib, Aleppo, rural areas of Damascus. At the moment they are limited, but do occur. The risk we face is that factors such as a generalized lack of immunization and mass population displacements are brought together. Some of these infections are transmitted through the air, so we may find ourselves in a situation where infections spread as an epidemic that we cannot control. During the winter people choose not to move much because of the cold. With the arrival of good weather it is expected that people will try to return to their places of origin, where the conflict has ceased, as in the city of Aleppo, or areas such as Al Bab that are changing control in the framework of offensives. On the one hand, in our Al Salamah hospital in Azaz district, Aleppo governorate, we have been carrying out an expanded program of immunization once a week, for several years now. In July of last year, we also started sending teams to the displaced camps in the northern part to curb the risk of outbreaks of infections. We concentrate on an area with an estimated population of 200,000 people, of which 17% are under the age of five (about 34,000). It is a process that includes three rounds and we are still working in collaboration with other humanitarian actors responsible for implementing vaccination, while MSF provides the vaccines, ensures the maintenance of the cold chain through a monitoring process and trains the vaccinating teams. In 12 days, 6,540 children under the age of 15 were vaccinated, 93% of the target. On the other hand, in the last year we have launched two specific campaigns of vaccination of measles, the last one of them in January after seven cases were confirmed in the displaced camp of Shamareek. The vaccination was led by MSF and the campaign was also joined by the World Health Organization (WHO) along with local medical organizations. In 12 days, 6,540 children under the age of 15 were vaccinated, 93% of the target. At the moment we are studying the possibility of expanding our actions to other places. In the three districts of the northern part of Aleppo governorate where we are working we estimate that there are about 143,000 children under the age of five. 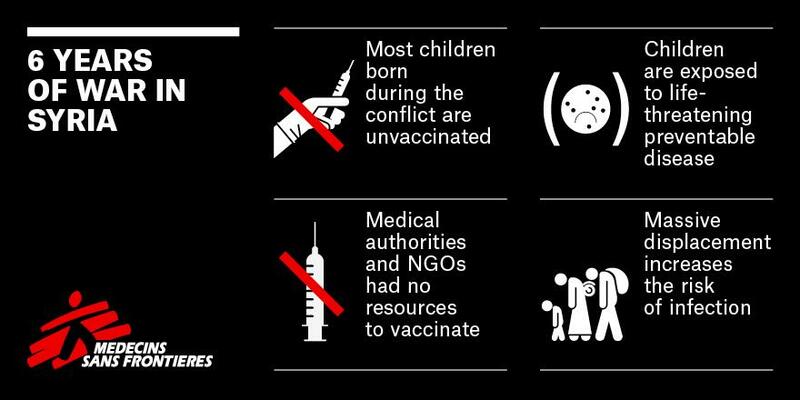 What challenges do MSF teams face when it comes to vaccination? Sometimes we have met resistance from the population. The work of health promotion teams in talking to mothers to help them understand the benefits of these preventive measures for their children is critical. Usually, the acceptance is good and those families that have had several children already go through this understand the need. Why aren't there more organizations providing vaccinations in Syria? These are programs that cost a lot in terms of human resources and are expensive. It is also difficult to both get the vaccines and to keep them cold in order to not spoil them. This happened to us, for example, in the city of Aleppo. It was impossible to introduce vaccines there because of the siege between July and December 2016. We did not have a specialised supervisor to offer guarantees that the cold chain was maintained and, therefore, that the quality of the vaccines was maintained. We believe that WHO, other UN agencies and other medical actors should press for increased population coverage in vaccinations. Small steps are being taken, such as an immunization program for children under one-year-old in the provinces of Hama and Idlib. But it's not enough. Syrian children deserve greater protection against a complicated future. Between July 2016 and February 2017, MSF has vaccinated a total of 35,907 children under the age of five in four districts in the northern governorate of Aleppo in the framework of an expanded immunization program. 5,733 women of childbearing age (between 15 and 45 years of age) have also been vaccinated for tetanus. 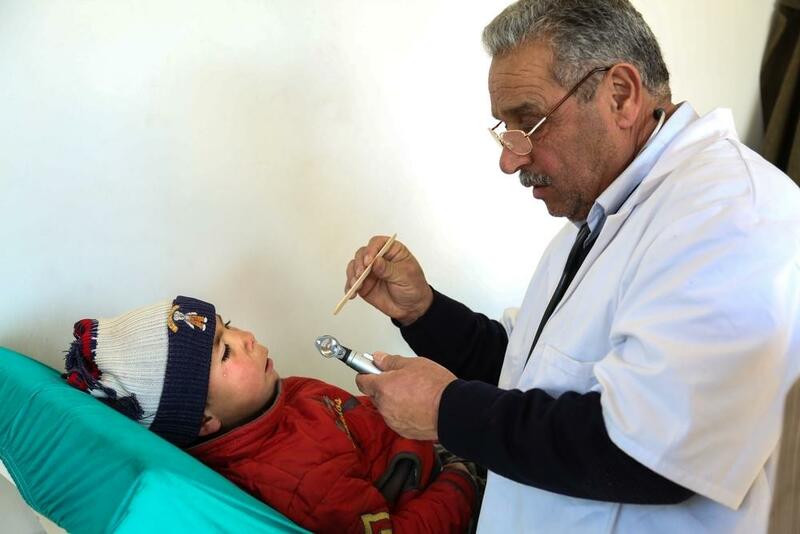 In addition, MSF conducts vaccination initiatives in several other governorates of Syria.